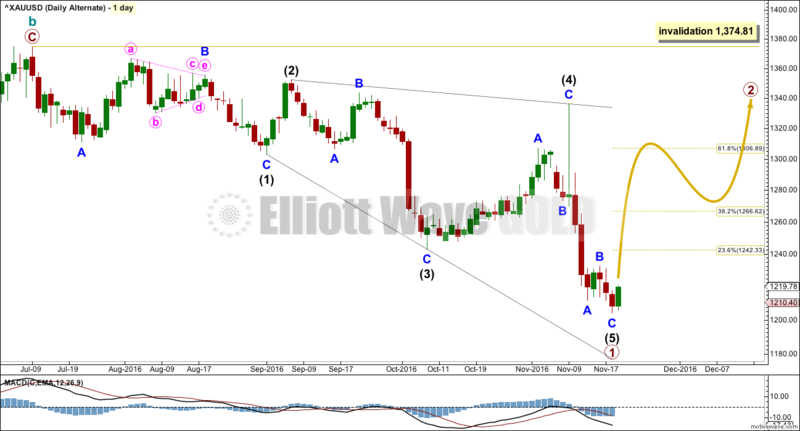 Another upwards day fits the second hourly Elliott wave count. Price is now just above the target range, which was 1,219.11 to 1,233.43. Last analysis expected upwards movement to begin the new week. So far this is what has happened. Summary: Upwards movement is expected from here. The target at 1,533 may be met in about six months time. There is divergence with price and Stochastics and RSI indicating bears are exhausted. 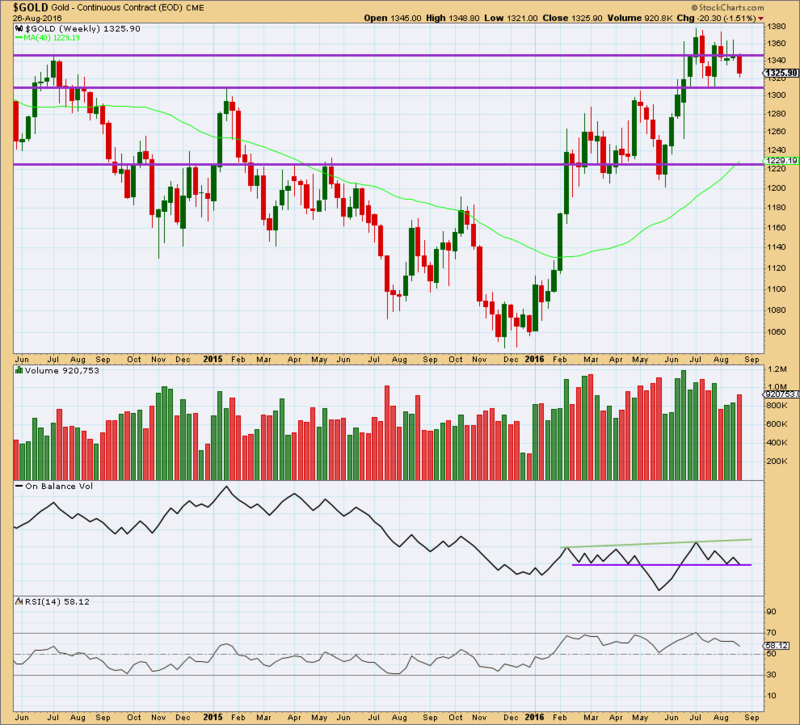 If this view is wrong today, then Gold may make one final new low to a target at 1,203 before turning. 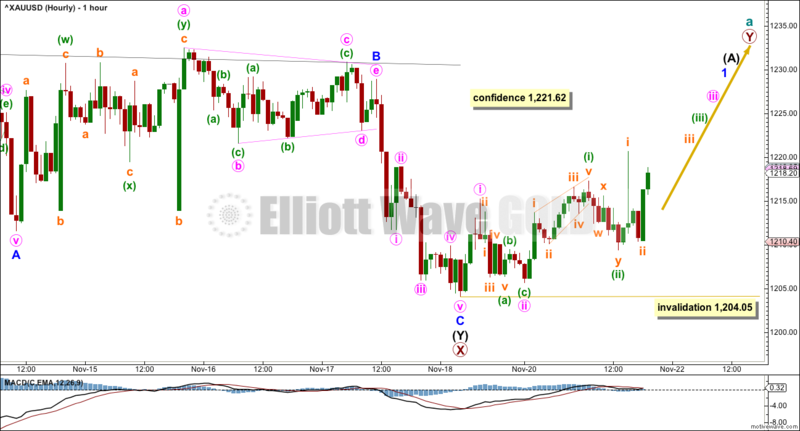 A new high above 1,221.62 would add confidence in a trend change. Last monthly and weekly charts are here. The larger structure of primary wave X may be either a double zigzag or a double combination. The second structure in this double for primary wave Y may be either a zigzag (for a double zigzag) or a flat or a triangle (for a double combination). It is my judgement at this stage that it is more likely primary wave X will be a double zigzag due to the relatively shallow correction of intermediate wave (X). Although intermediate wave (X) is deep at 0.71 the length of intermediate wave (W), this is comfortably less than the 0.9 minimum requirement for a flat correction. Within combinations the X wave is most often very deep and looks like a B wave within a flat. However, there is no minimum nor maximum requirement for X waves within combinations, so both a double zigzag and double combination must be understood to be possible. A double zigzag is more likely and that is how this analysis shall proceed. Within the second structure, minor wave A should be a five wave structure. This now looks complete. Minor wave B found resistance at the lower edge of the wide parallel channel about primary wave X. Minor wave C may now be complete at the hourly chart level. Minor wave C has no Fibonacci ratio to minor wave A. Intermediate wave (Y) is just 0.02 longer than equality in length with intermediate wave (W). At 1,533 primary wave Y would reach equality in length with primary wave W.
Primary wave W lasted seven months. Primary wave Y may be expected to be about even in duration. Minor wave B completed as a regular contracting triangle. 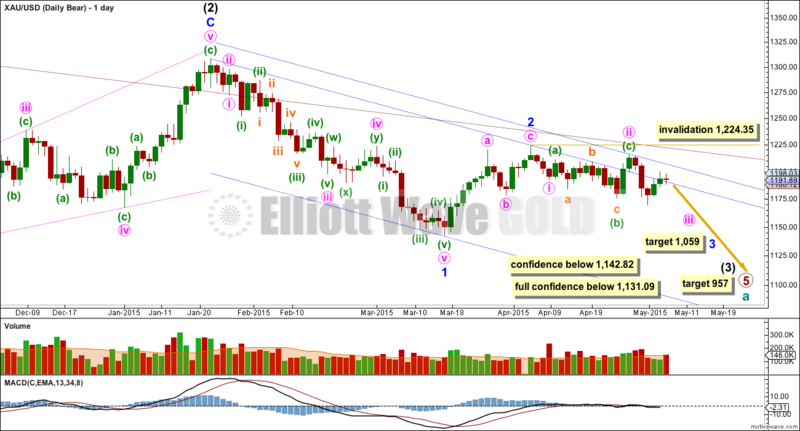 Gold often exhibits surprisingly short waves out of its triangles. Minor wave C has moved slightly below the end of minor wave A, avoiding a truncation. The structure now looks complete at the hourly chart level. Within minor wave C, there are no adequate Fibonacci ratios between minute waves i, iii and v.
Within the new upwards movement, the spike labelled subminuette wave i may disappear from BarChart data tomorrow. It is not noticed on other Gold data feeds. 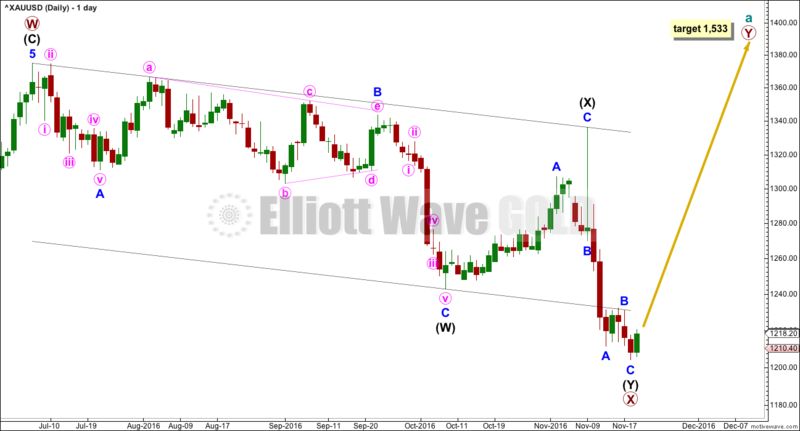 Intermediate wave (A) should subdivide as a five wave structure if cycle wave a is a double zigzag. Within intermediate wave (A), the upcoming correction for minor wave 2 may not move beyond its start below 1,204.05. When there is a clear five up on the hourly chart, then more confidence may be had in this wave count. A new high above 1,221.62 would add confidence. At that stage, the second hourly chart below would be invalidated. What if minor wave B was not a triangle but completed as a zigzag? Minor wave C may have begun earlier. Minor wave C must complete as a five wave structure. It may need on final new low to end minute wave v within it. Within minor wave C, there is alternation between the zigzag of minute wave ii and the combination of minute wave iv. At 1,203 minute wave v would reach 1.618 the length of minute wave i. There is no Fibonacci ratio between minute waves i and iii, so a ratio for minute wave v is likely. Minute wave iv may not move into minute wave i price territory above 1,221.62. While this wave count is entirely possible, it is judged to have a lower probability than the first hourly chart today. This alternate wave count expects that the large upwards zigzag from the low of 1,046 in December 2015 to the last high of 1,374 in July 2016 is a complete correction. The trend is still down; Gold is still in a bear market. If there has been a cycle degree trend change at the high labelled cycle wave b, then the new wave down must begin with a five wave structure. At this stage, there looks to be too much overlapping for an impulse, so a leading diagonal is considered. Within leading diagonals, sub-waves 2 and 4 must subdivide as zigzags. Sub-waves 1, 3 and 5 are most commonly zigzags but sometimes may also appear to be impulses. Within this structure, all sub-waves subdivide as zigzags. This wave count meets all Elliott wave rules. This diagonal looks correct. Primary wave 1 lasted 94 days. Primary wave 2 may initially be expected to last about a Fibonacci 55 or 89 days. It should be a big three wave structure. At this stage, there is no divergence in expected direction between this alternate and the main wave count. The structure of upwards movement, if it is clearly a three or five, may assist to tell us which wave count is correct in coming weeks. For now this alternate must be judged to have a low probability due to the problems outlined. It is published to consider all possibilities. Last week completes with a smaller range and a substantial decline in volume. The fall in price is not supported by volume, so it is suspicious. It looks like bears are tired. Price may find support here about 1,200. On Balance Volume has come down to almost touch the yellow support line. There is a very little room for more downwards movement. This line should be expected to provide support and assist to halt the fall in price either here or very soon. RSI is not extreme and does not exhibit divergence with price. There is room still for price to fall further. A small upwards day with higher high and a higher low has moved price higher. The upper wick of today’s candlestick is relatively long and the real body is small. This is not a strong upwards day. Volume is light; the rise in price today did not have support from volume. This candlestick looks like a small counter trend correction. Sometimes Gold’s new waves do begin with some hesitancy. However, at this stage, today’s candlestick favours the second hourly chart which expects Gold to make one more slight new low before turning. 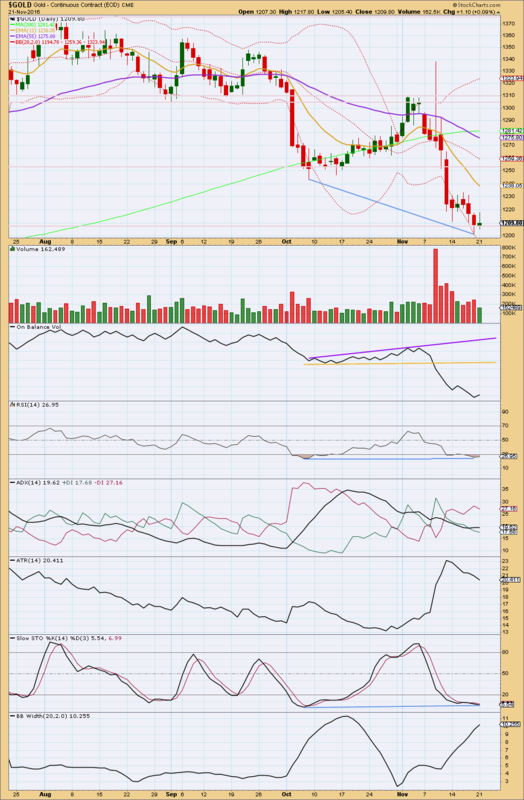 There are no support lines at the daily chart level for On Balance Volume to help stop a fall in price here. There is still mid term divergence between price and RSI and Stochcastics at the two lows of the 7th of October and the 18th of November. 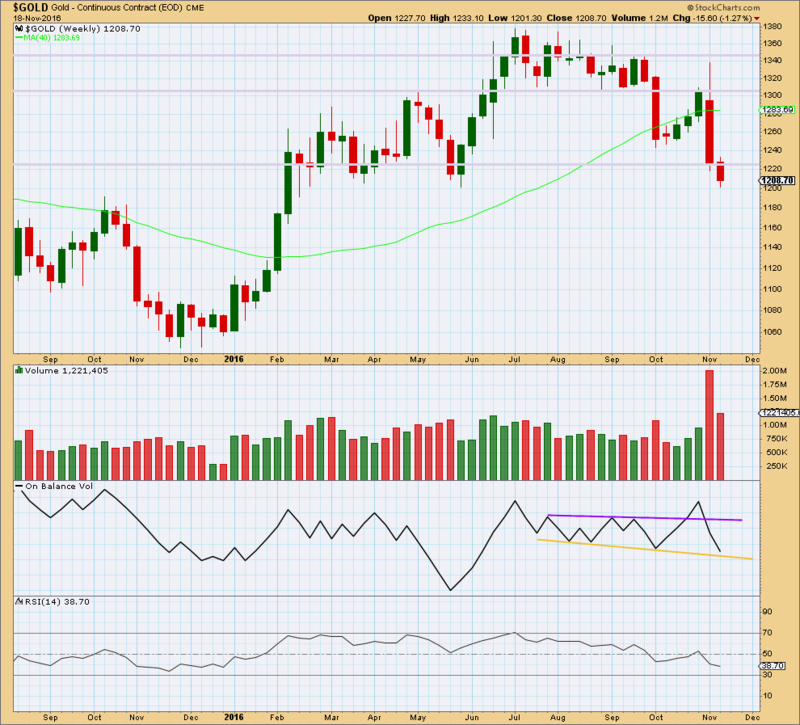 This is regular bullish divergence and indicates bears are exhausted. ADX has slightly increased further today. It still indicates a downwards trend is in place. This is a lagging indicator though as it is based upon a 14 day average. If there is a downwards trend, then it is showing some signs of weakness; ATR is declining. Bollinger Bands continue to widen though indicating a trending market. The Elliott wave count here is indicating a trend change before these indicators. 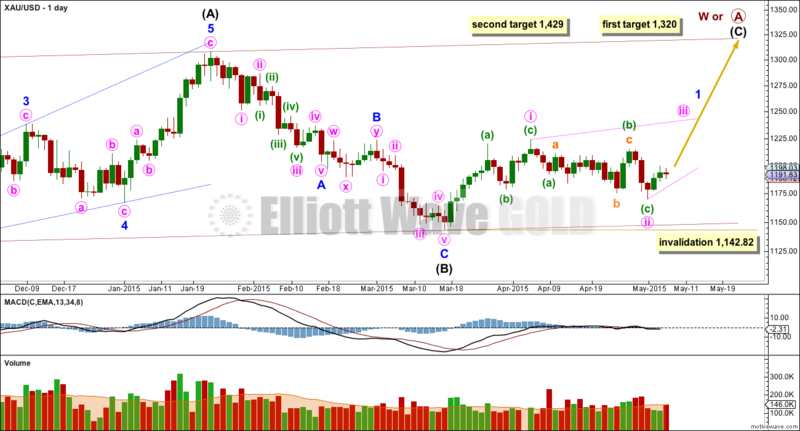 If the main Elliott wave count is wrong, then the second hourly chart may be right and Gold may make one more low before turning. This analysis is published @ 09:02 p.m. EST. 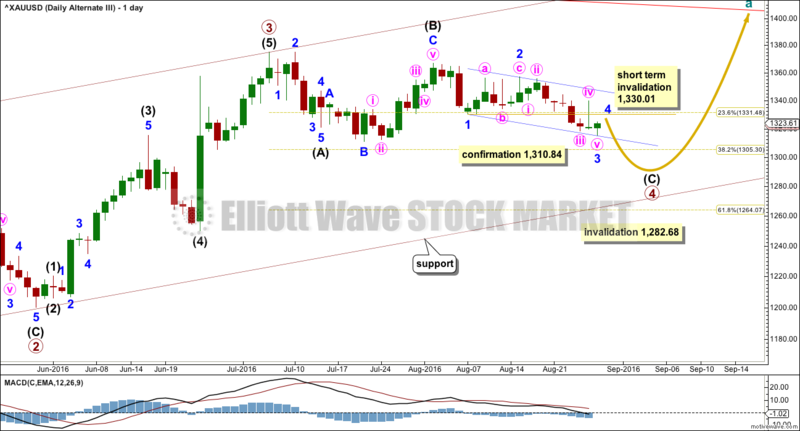 All three daily Elliott wave counts remain valid. The invalidation / confirmation point may now be moved lower today. Summary: Some more downwards movement next week looks most likely, to about 1,279. If this target is wrong, it may be a little too low. In the short term, a new high now above 1,330.01 would be confirmation that the correction is likely over and the next wave up has begun. Last weekly charts are here. Primary waves 1 and 2 are complete. Thereafter, this wave count differs from the two alternates. This main wave count will expect primary wave 3 to be longer than primary wave 1. Because this is very common, this is the main wave count and it expects the most common scenario is most likely. At 1,582 primary wave 3 would reach 1.618 the length of primary wave 1. Primary wave 3 may only subdivide as an impulse. Minute wave iv may not move into minute wave i price territory above 1,330.01. 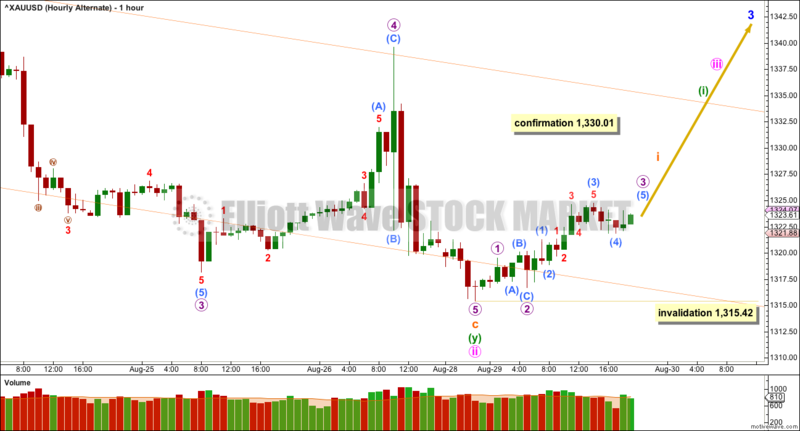 If price moves above 1,330.01 in the short term, then it may also be possible that minute wave iii is not over. 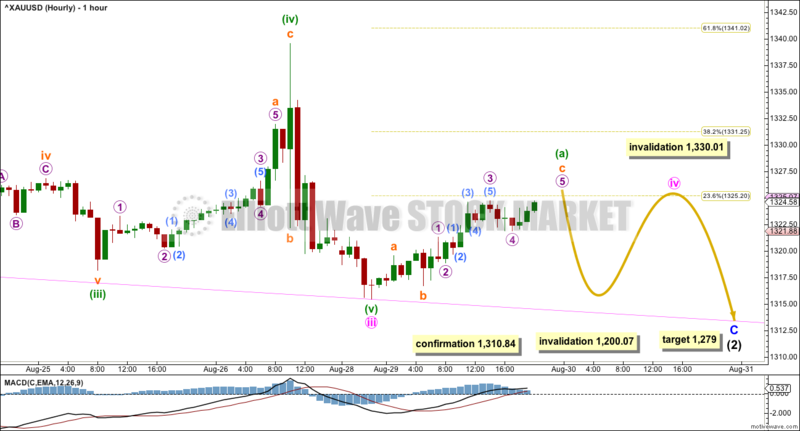 No second wave correction within minute wave iii may move beyond the start of its first wave above 1,356.85. A new high above 1,356.85 would invalidated any continuation of minute wave iii and provide further confidence to the alternate wave count. At 1,279 minor wave C would reach 1.618 the length of minor wave A. Price may end downwards movement when it finds support at the lower edge of the maroon base channel drawn about primary waves 1 and 2. 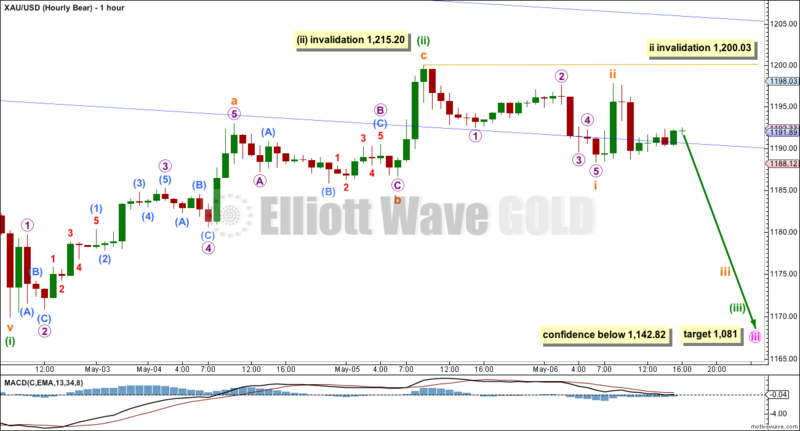 Intermediate wave (2) may not move beyond the start of intermediate wave (1) below 1,200.07. Primary wave 2 lasted 56 days (one more than a Fibonacci 55). So far intermediate wave (2) is more brief in duration. It has lasted 38 days and may be just a few days away from completion. Draw a small channel about minor wave C, using Elliott’s technique, and copy it over to the hourly chart. Minor wave C must subdivide as a five wave structure. This wave count would be confirmed with a new low below 1,310.84. Minor wave C still needs more downwards movement. Within minor wave C, minute wave iii is now complete. Minute wave ii was a deep zigzag, so to exhibit alternation minute wave iv may be a more shallow sideways structure and would most likely be a combination, flat or triangle. Minute wave iv may not move into minute wave i price territory above 1,330.01. When minute wave iv is over, then the target may be calculated at minute degree also. At that stage, it may change or widen to a zone. If it changes, it may be moved upwards. The duration of minute wave ii now gives this wave count the wrong look. Lower degree second waves should be more brief in duration than second waves of a higher degree. Here, minute wave ii has lasted 19 days, minor wave 2 lasted 11 days, and intermediate wave (2) lasted 6 days. At 1,437 intermediate wave (3) would reach equality in length with intermediate wave (1). At 1,552 intermediate wave (3) would reach 1.618 the length of intermediate wave (1). Minute wave ii may not move beyond the start of minute wave i below 1,310.84. 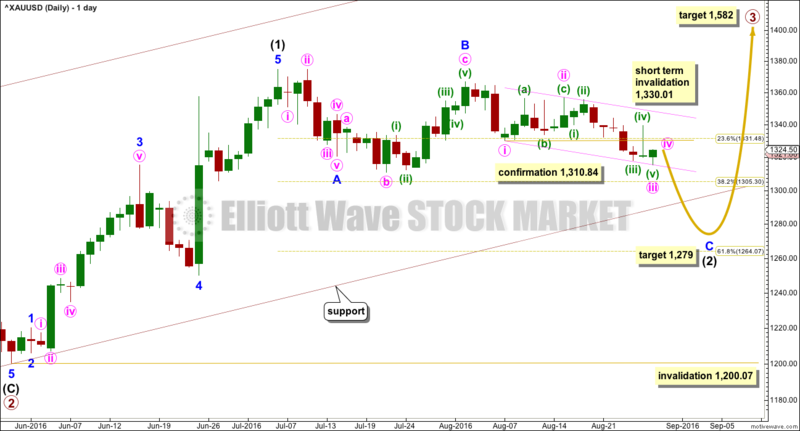 A new high above 1,356.85 would add further confidence to this wave count. At that stage, alternate ideas for the main wave count would be invalidated. A final fifth wave down would still be required for this alternate wave count. Upwards movement for Friday’s session will not subdivide as a five; it fits only as a three because of the deep spike labelled sub micro wave (B). Friday’s session would have to be another fourth wave correction for this alternate. After a slight new low, then this alternate wave count would expect upwards movement. 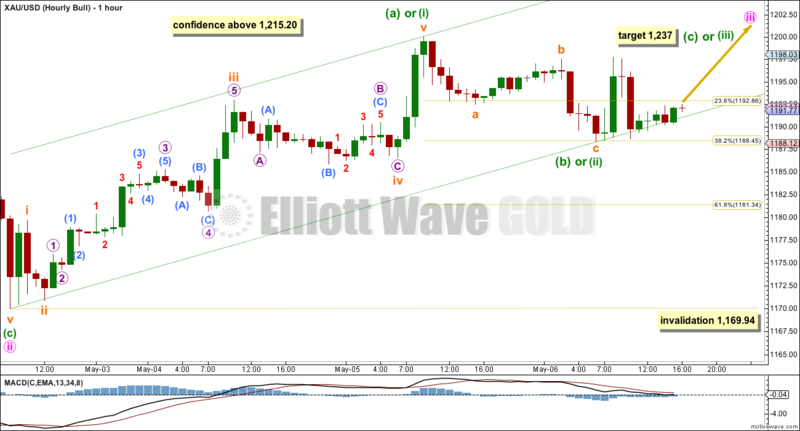 A new high above 1,339.48 is required for confidence in this wave count. At that stage, a third wave up at four degrees should be expected to be in the very early stages. It is possible that primary wave 3 is over and shorter than primary wave 1. Primary wave 3 shows stronger momentum and volume than primary wave 1 (see technical analysis weekly chart). If primary wave 3 is over, then the current consolidation for Gold would be primary wave 4. Primary wave 2 was a relatively shallow 0.35 expanded flat correction. Primary wave 4 may be unfolding as a deeper zigzag which would exhibit perfect alternation. Primary wave 4 may not move into primary wave 1 price territory below 1,282.68. Primary wave 5 would be limited to no longer than equality in length with primary wave 3, so that the core Elliott wave rule stating a third wave may not be the shortest is met. Primary wave 5 would have a limit of 174.84. This wave count expects more downwards movement to complete a five wave impulse for intermediate wave (C) in the same way as the main wave count expects a five wave impulse down to complete minor wave C. Only the degree of labelling differs; this wave count is one degree higher. The hourly chart would be exactly the same except for the degree of labelling. It is also possible that primary wave 4 may be a regular contracting triangle. If sideways movement continues in an ever decreasing range, then that idea would be published. At this stage, a zigzag looks more likely because the subdivisions have a slightly better fit. A strong downwards week with an increase in volume supports the main and alternate III wave counts. Overall, volume is still declining and price remains range bound. The prior two green weekly candlesticks had long upper shadows which was bearish. Price may find some support about 1,310. On Balance Volume at the end of last week has come down to find support at the purple trend line. This may help to stop price falling much further. RSI is not extreme. 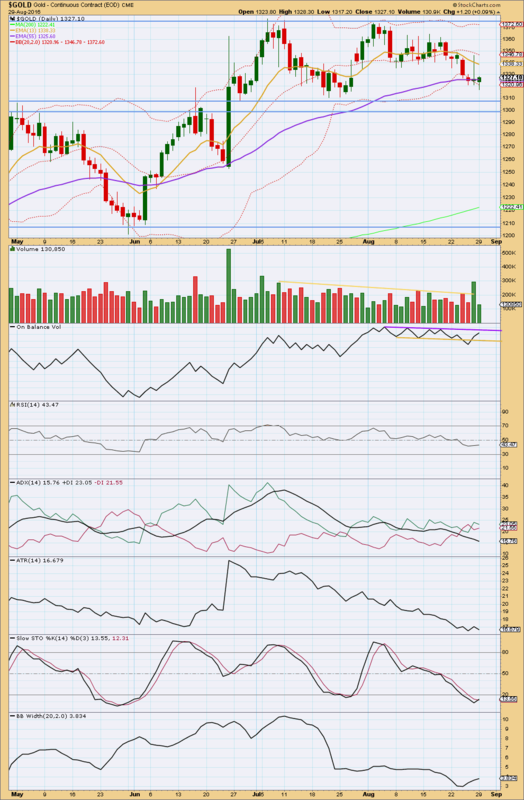 There is some hidden bullish divergence with price and RSI: RSI has made a lower low below the low of 25th of July but price has made a higher low. This indicates some weakness to this downwards movement. It is more likely to be a smaller correction than a sustainable trend. Overall, price remains range bound with resistance about 1,375 and support about 1,310 – 1,305. This range bound period began back on 7th of July. During this range bound period, it is the two upwards days of 8th of July and 26th of August which have strongest volume suggesting an upwards breakout is more likely than downwards. This supports all three Elliott wave counts. The long lower wick of today’s candlestick is bullish as is the colour. However, the decline in volume is bearish; this upwards movement for Monday is not supported by volume, so it is more likely a counter trend movement (within a small downwards swing within the larger consolidation) than the start of a more sustainable upwards swing. The 55 day moving average may provide some support here. On Balance Volume may find resistance at the purple line. This may assist to halt the rise in price. A break above the purple line would be a reasonably strong bullish signal. RSI is not extreme. There is room for price to rise or fall. There is no divergence today between price and RSI to indicate weakness. ADX continues to decline and the +DX and -DX lines are whipsawing about each other. ADX indicates this market is not trending. ATR agrees as it too continues overall to decline. Stochastics is oversold. Price has not yet reached support at 1,310 though, so a little more downwards movement from price may be expected before this downwards swing is over. This approach expects the same movement next as the main Elliott wave count. Bollinger Bands are widening now for three days in a row. A trend may be beginning to return. If it is, then it would be down. However, this contradicts ADX and ATR. Overall, the decline in volume for Monday suggests a little more downwards movement ahead for price to find support about 1,310 – 1,305 to end this downwards swing. An upwards breakout of a triangle was expected. Price broke out downwards, which was confirmed with a new low below 1,066.63. The Elliot wave count has changed. The trend was expected to be down. 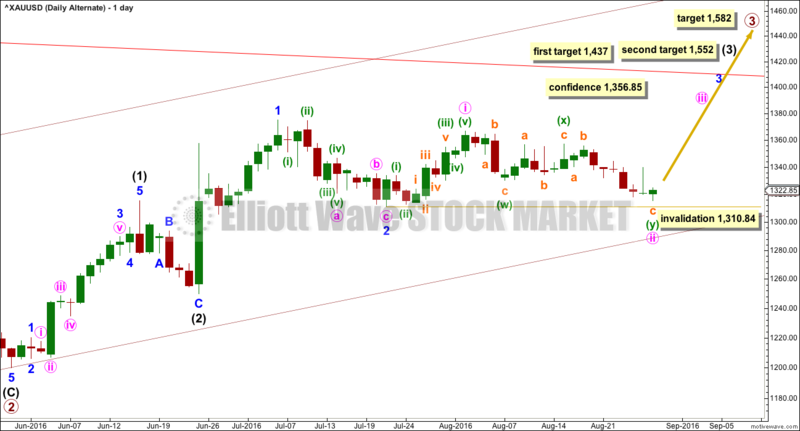 Sideways / downwards movement was expected for both Elliott wave counts. Price moved lower then retraced almost all of the loss to complete a hanging man candlestick pattern for the session. Last analysis expected a red candlestick for Friday, which is what happened. Both bull and bear Elliott wave counts remain valid. Both Elliott wave counts remain valid today. A little more downwards movement was still allowed for. The invalidation points are now extremely close by, but still not breached. 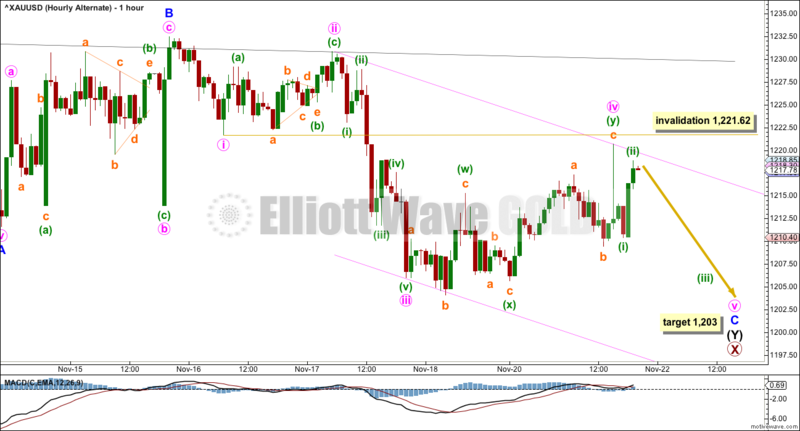 Upwards movement was unexpected and invalidated both hourly Elliott wave counts. At the daily chart level they both remain valid. I have a new Elliott wave count today. A little more upwards movement to the upper blue trend line was expected. Price has moved higher, but falls slightly short of this trend line. Some upwards movement was expected, but the target at 1,226 has been passed. The Elliott wave count remains the same, and I have a new alternate for you.